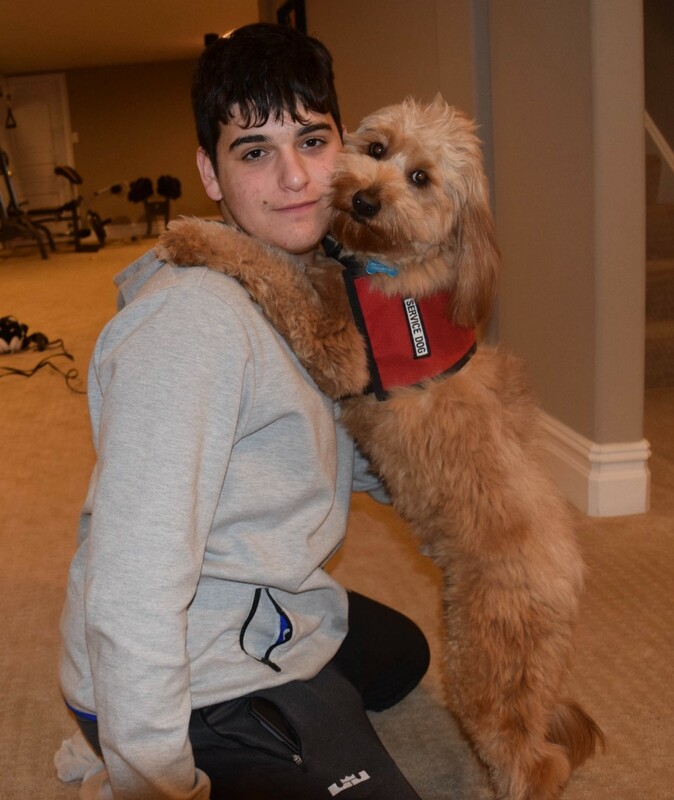 Cherry Hill High School East junior Ben Shore is hoping to bring his service dog, Charlie, to school, as the school district works on revising its policy on service animals. Ben Shore holds his dog, Charlie, in his arms inside his Cherry Hill home. 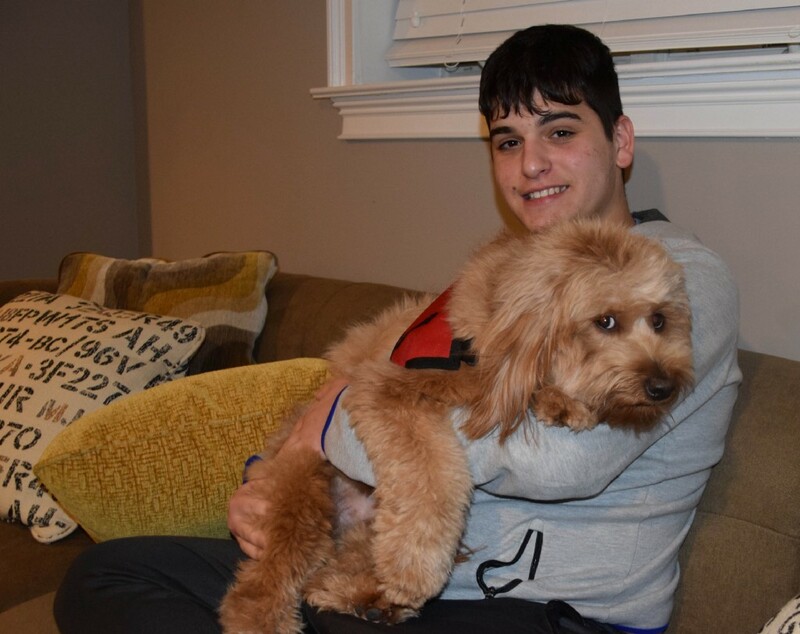 Shore, a junior at Cherry Hill High School East, is hoping changes to Cherry Hill Public Schools’ policy on service animals will allow him to bring Charlie to school. Cherry Hill resident Ben Shore, 16, says his dog, Charlie, has changed his life. Shore suffers from symptoms of autism as well as panic attacks. More than a year ago, Shore acquired Charlie, a certified service dog. Charlie is trained to recognize Shore’s symptoms and can calm Shore down when he senses a panic attack is imminent. “He made me independent,” Shore said of Charlie. Shore can take Charlie to many public places, but one place he hasn’t brought Charlie is school. Cherry Hill Public Schools has a policy on service animals requiring approval from a building teacher and principal. A number of conditions are attached to having a service animal in school, and the policy specifically prohibits any service animal from traveling on a school bus. A junior at Cherry Hill High School East, Shore said the policy has prevented Charlie from coming to school with him. Upon learning about the policy, Shore was determined to change it, saying it violates both federal and state law. Shore filmed a conversation with Superintendent Joe Meloche during the Cherry Hill Board of Education’s policy and legislation committee meeting on Jan. 2, and posted the videos to his YouTube channel. In the week following the release of the videos, a ton of conversation has taken place in the community. The legality of the school district’s policy has been debated, and school officials have since said the policy is being revised to comply with federal law. However, revising the policy to comply with the law is only part of the conversation. Shore said he had known about the school district’s policy on service animals for a little while. For him, the most frustrating aspect was the number of barriers one must clear before a service animal can be brought into school. According to the policy, a building teacher and principal must grant approval for a service animal to be allowed in school. If an animal is approved, it is subject to a number of conditions. The animal’s presence must be announced to the entire building community in advance, and the health plans of every student in proximity of the animal need to be reviewed for allergy or other health concerns. The trainer of the animal must be licensed, insured and certify the animal’s safety. The parents must show documented permission for the service animal. The child’s health, 504 plan or individual education plan must be amended to reflect the service. In addition, if there is a conflict involving other students having allergy issues or other concerns around the animal, a teacher’s assistant will help the child rather than a service animal. Leah Levine, CEO and founder of Animal at Work Inc., a nonprofit organization advocating for the civil rights of individuals who use service animals, worked with then-state Sen. Donald Norcross to get the state legislature to pass the current law in 2012. Levine said the district’s policy is not in compliance with the law. “It totally flies in the face of the law on the state level,” she said. According to the law, a school official may only require a certification from a veterinarian saying the service animal is vaccinated and does not have a contagious disease, and a municipal license. Shore follows the state law closely, carefully taking care of Charlie. Guidelines for how the school district handles service animals predates the changes in state law. According to a document from Barbara Wilson, public information officer for Cherry Hill schools, the policy is based off an administrative procedure the district adopted in 2006. Entitled “Use of Supplementary Aide to Instruction,” the procedure details the use of service animals for student needs. The district’s policy is based off the same guidelines set forth in the document. On the board of education’s Jan. 10 work session agenda, a revised policy for service animals was listed as an item to be voted on at the board’s next action meeting on Jan. 24. During the work session meeting, board member Jane Scarpellino, chairperson of the board’s policy and legislation committee, confirmed the district was revising the policy to bring it up to date with Americans with Disabilities Act regulations. Meloche said over the last two years, the district has changed the way its policies are developed and maintained. In the past, the district did all of its policy work internally. A couple years ago, however, the school district entered into a contract with Strauss Esmay Associates, a law firm specializing in school policies. All of the district’s policy are now hosted on Strauss Esmay’s website. The school board spent a good portion of the 2015–16 school year re-adopting policies as part of the transition. One of the re-adopted policies was the service animal policy. Meloche said the re-adopted service animal policy last spring had not been revised to reflect recent changes in the law. Meloche said the new policy would be much more substantive than the previous one. School officials are not releasing the draft policy to the public yet, saying revisions are still in the works. Some other school districts in New Jersey have adopted service animal policies in recent years. Many of these policies mirror the changes made in state law and ADA regulations. The policy for Teaneck Public Schools in North Jersey notes federal and state law permits service animals in schools. The only documentations the district needs from the service animal are an up-to-date vaccine report and municipal dog license. The only reasons a district can remove a service animal from a school is if the animal presents a “direct threat” to the health and safety of another, the animal is “out of control” or if the animal is not housebroken. In the Hamilton Township School District in Mercer County, the policy says the district shall permit the use of a service animal unless the animal is either out of control or not housebroken. It also notes the district cannot require documentation of the animal’s certification or ask the dog to demonstrate its working ability. It requires service animals to be licensed and registered according to state and local laws. Unlike Teaneck, there is no mention of a vaccination requirement. Levine hopes the Cherry Hill Public Schools’ policy mirrors the laws put in place at the state and local level. She described service dogs not as an animal, but rather as an important piece of medical equipment. She described a student having a service dog as similar to a student who uses a wheelchair. “This is to benefit the person with the disability,” Levine said. Ben’s father Eric is an attorney and has reviewed the district’s policy and the laws regarding service animals. Eric feels the district will make the correct decision and make sure the policy becomes compliant with the law once it is finally approved. “I really think once the school district reads the law, they will make the right decision,” Eric said. Adopting a compliant policy is only part of the process for the school district. Some members of the Cherry Hill community believe there are implications behind allowing service animals in schools. Cherry Hill resident Ashley Misinkavitch’s son, Parker, is attending kindergarten at Kingston Elementary School. When the service animal discussion began in early January, it immediately caught Misinkavitch’s attention. Parker suffers from anaphylaxis, meaning he has a severe, life-threatening allergic reaction around dogs. When Parker suffers an allergic reaction, Misinkavitch said his face and eyes swell and his throat closes. If untreated, Parker could die within a few minutes. Wherever Parker is, he needs to have an epinephrine pen near him in case of an allergic reaction. If Parker suffers a reaction, the pen, featuring a long, thin needle, is jammed into his leg. The medication stops the reaction and quickly speeds up his heart. Parker then needs to be taken immediately to the nearest hospital for further treatment. The prospect of having service dogs in school buildings frightens Misinkavitch. She said Parker could have an allergic reaction from dog dander simply traveling through a building’s ventilation system. Even if the dog isn’t in the same room as Parker, he could have a reaction. “The animal can’t be in the same building as my son,” Misinkavitch said. Misinkavitch is seriously concerned about the district’s revised policy because ADA regulations state a person’s allergies are not a valid reason for denying a service animal access. Shore said he understands allergies first hand. He and his father both have allergies, leading them to acquire Charlie, who is hypoallergenic. Levine also acknowledged allergies are a big concern for many, but added people walk around with dog dander in public places all the time. She said a school district should follow federal regulations when dealing with allergies and service animals. “If a child is allergic, the child who is allergic gets moved,” Levine said. Parker and Shore are at completely different points in their school careers and don’t attend school in the same building. However, Misinkavitch said the district’s new policy will set a precedent and could allow a service animal to eventually be in the same building as her son. She fears such a scenario could be deadly to Parker and wants the board to come up with a solution for the final service animal policy. “There needs to be some form of compromise based on the needs of the students,” Misinkavitch said. There are still a few weeks before the board of education can adopt a new policy. The earliest a first reading for the policy can take place is Jan. 24. The policy must then go through a second reading, taking place no earlier than February. Regardless of the outcome, Shore is happy to have gotten the community’s attention. He believes informing the community about the issue at hand is the first step toward making positive change. For the Shore family, there is some uncertainty as to how the policy will read. They plan to take a close look at the policy as soon as possible to make sure it is in full compliance. Once the district’s revised policy is adopted, Shore said he plans to finally bring Charlie to school as long as he feels welcome.